First, open the paper bag and stuff it full of paper, leaving about 2-inches of head space. Insert the paint stir stick into the bag as far as it will go. Be careful not to push it through the end of the bag! Tie the open end of the bag closed using yarn. Secure the ends of the bag to the paint stir stick using hot glue. Paint the bag with goldenrod paint and set aside to dry. Print out the patterns and cut the shirt from green felt and cut a piece of blue felt into a 3.5"x5" rectangle. When the paint has dried, glue the blue rectangle around the "neck" covering the opening of the bag. 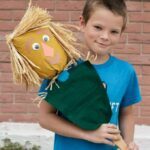 To keep the scarecrow's shirt from flopping around, glue three jumbo craft sticks to the back of the green felt, they will look like ribs! Add two regular sized craft sticks to hold the shoulders in place as well. Glue the shirt to the paint stir stick. Add a few short strands of raffia to the neck and shoulder areas. Using the patterns, cut out the mouth and eyebrows from brown construction paper and the nose from orange construction paper. Glue all the facial features to the bag. Raffia usually comes in very long strands that are gathered up in an oblong roll. You'll need to do some counting here and estimating to make sure your bunches of hair are approximately the same size. Unroll the raffia cut off a section of strands (about 4-5 inches long). Gather several strands together and secure the end with a rubber band. Repeat this process until you have 13 rubber banded bunches. Make more if you want the cover the back of the scarecrow's head as well. We only covered the top and sides. Starting a couple inches from the top of the head, glue 3 bunches of raffia to the side of the bag. Glue 3 more above those, overlapping them. Repeat this for the other side of the head. Glue the remaining 7 bunches across the top of the head. You may need more or less depending on the size of your bunches. This project for Paper Bag Scarecrow was printed from CraftsbyAmanda.com - https://craftsbyamanda.com/paper-bag-scarecrow/ and can only be printed for education or personal use.